LEN - www.lankaenews.com | I have majority power ; govt. will continue – special statement by P.M. (Video) ! I have majority power ; govt. will continue – special statement by P.M. (Video) ! (Lanka-e-News - 16.Feb.2018, 9.30PM) The present government of which he is the prime minister (P.M.) still has the majority . 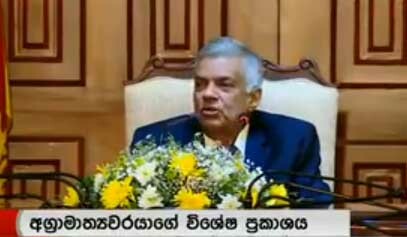 If the prime minister is to be changed , that must be done in accordance with the constitution and traditions , Ranil Wickremesinghe P.M. elucidated in the special statement made by him today (16). The P.M. responding to the queries made by the mass media that the president is seeking advice of the Attorney General (AG) to change the P.M. , the latter said , the constitution has mentioned how a P.M. can be changed ,and that is via a defeat following a no confidence motion or budget. When replying to the question whether he has the majority ,the P.M. most confidently and calmly said , there is the majority and the government will be continued , but some cabinet ministerial changes have to be effected. Issues proliferating within a coalition government is natural and a matter of course , he pointed out .